Social game lovers, we have something yet again for you and this time, it is being served on a well-garnished platter. Yes, it is Stand O’Food 3, the third installment of the franchisee. 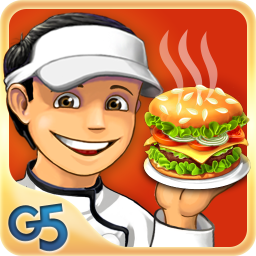 The most popular burger-serving game gets a much-awaited sequel. Created by G5 Entertainment, a top developer on the Android Market, this game is really fun and lives up to the standarts of the previous two parts in the series. G5 have developed some of the most entertaining games for Android & iOS, and this one is no exception. Much like Supermarket Mania and other game titles developed by G5 Entertainment, there is a story told as players progress through the stages. They are visually appealing and displayed a bit like a comic book, which overall is a nice touch. The game boasts of three difficulty levels with each one having its own challenges and obstacles. Stand O’Food 3 boasts of over 75 levels and 12 additional bonus levels in whole. While players might start out flipping burgers, it’s not long before other food types appear with levels centered on creating lasagnes, desserts and salads too. It’s a small touch but it keeps things interesting. 90 recipes in all can be created with all the ingredients available in-hand, which also includes French fries, coffee and soda. Competition hungry players will be very satisfied to achieve a perfect score after serving numerous customers correctly and efficiently in a row. Controls are responsive and accurate and giving the term intuitiveness an all-new dimension. Overall, the game is great and features a lot of options, enabling players to add their own midas touch to their surroundings and way of management. Osu! – This Free Rhythm Game is One Click Away!